First off, everything will be ok! Being exposed to germs can be a good thing for keeping your immune system strong and healthy. With that being said, there are a number of ways to go about cleaning and disinfecting touch panels with very minor, if any repercussions. Resistive has one of the best reputations for durability and requires very little maintenance to keep in good shape. When building Resistive touch panels, they go through a series of processes, two of which consist of a hot hydrochloric acid bath, followed by a hot lye bath. If the screen is able to withstand opposite ends of the PH balance before it even gets into your hands then you must know it’s resilient. PCAP is even more durable, thanks to the vast majority built with glass covers. Cover glass has countless advantages including clearer resolutions and scratch resistance while matched with an incredible lifespan. Speaking from a chemical stand point, glass is virtually indestructible; there are very little chemicals that would harm the glass that wouldn’t harm a human. So, don’t worry as much about damaging the screen, we built them to be tough! The most commonly used solution for Resistive and PCAP is just a simple isopropyl alcohol sprayed on a dry or soft cloth. Try to avoid using organic solvents and for dirt or residue use a neutral detergent or ethanol for clearing the touch panel. 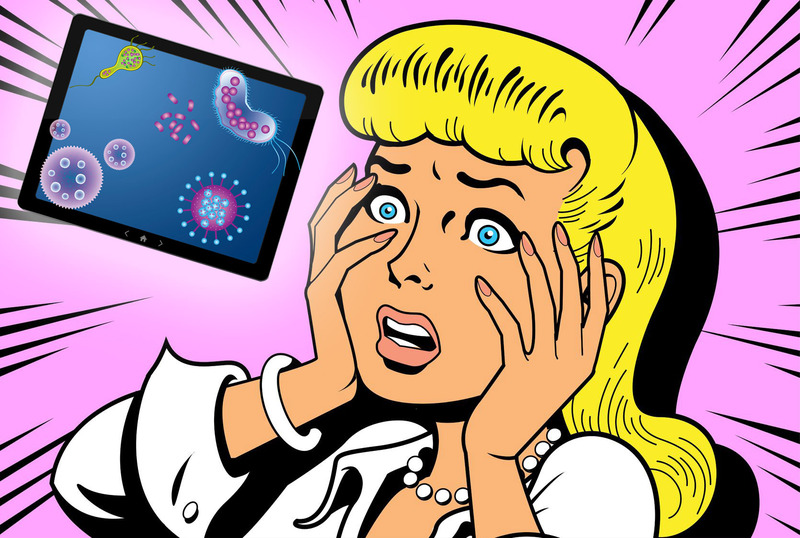 A little known fact that might calm your nerves is every person has more germs on them and inside them than cells in the body. So go ahead and disinfect your workspace but don’t feel the need to constantly clean; it may do more harm than good!